We just left MagicJack due to continued poor connections - many callers complained about the quality. 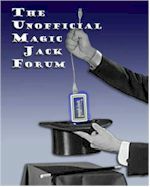 We now find that no other MagicJack callers can not reach us and they get a message saying that "The number is no longer in service" even though it ported to another provider and works with all other providers. Has anyone else had this issue? I chatted with 2 MJ reps and nobody has a solution. One even told me that its up to the new provider - HOGWASH, as it is a MJ message saying the number is no longer in service. Can anyone provide a name and contact number for a significant person at MagicJack so I can discuss the issue?